John Gowing b. abt 1600-1615 (Note: It is unknown if John Gowing b. 1600-15 had any children. The following are noted in Virginia, and appear to have been transported from Maryland, or are not noted as being transported – meaning possibly born in Virginia. They are the age that his children would be – a best guess based on information available). Children: (Note: again, this is not confirmed – it is based on the documents available and making the best guess based on those documents currently available). 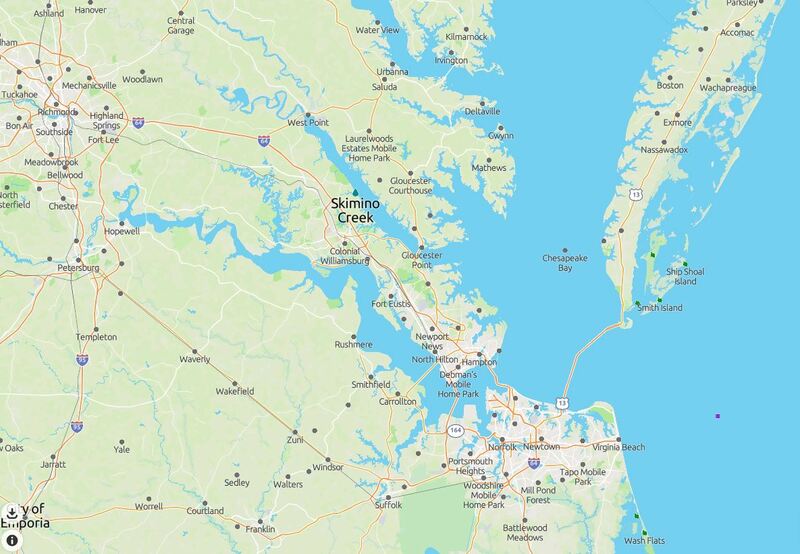 October 18, 1650 a John Goane is transported to Virginia by a Walter Broadhurst, Gent., who receives 500 acres on the S. side of the “Potomeck” R. near the mouth of Canowoman Creek. Others transported were William Hardigg, Robert Beard, William Enson, Ann Knowles, Richard Broadman, Humphrey Farmar, John Piper, Richard Sabrell, and 2 Indians. (See note 9 below). Obviously, the “2 Indians” were not transported to Virginia from England or Europe – they had to be transported from another location in the Americas. 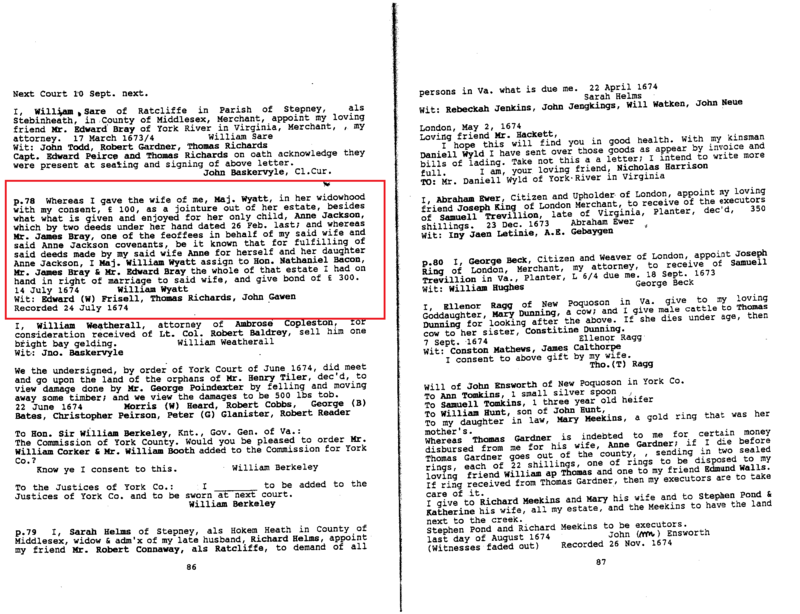 Looking at the others listed as being transported, William Hardigg, John Piper, Robert Beard, Richard Sabrell – all these people are noted in documentation related to Maryland. (See: John Hollis 1612 to 1615). April 14, 1653 a William Gowin is transported to York County, Virginia by Mr. William Hoccaday, who receives 1000 acres in York County, Virginia near the head of Ware Creek and Warany Creek. (See note 12). 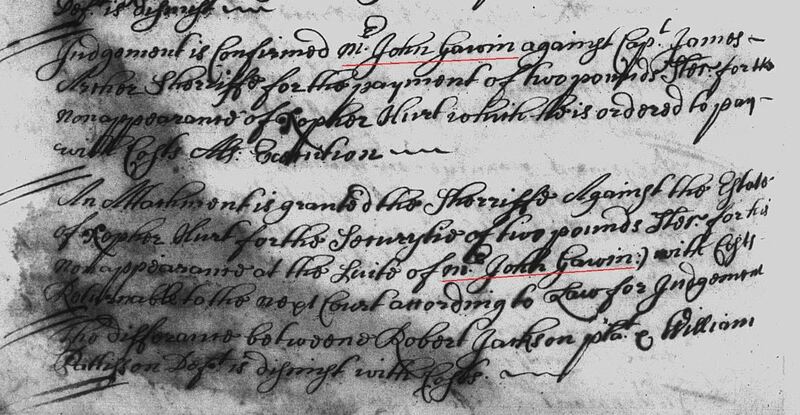 John Gowen is the master to servant Arthur Severne in York County, Virginia in 1661 (See note 18). The John “Goane” who was transported from Maryland to Virginia may be this same person, and may have moved to York County, Virginia around the same time as William Gowin arrived there in 1653. John Gawen witnesses a deed for Major William Wyatt, where he assigns to Hon. Nathaniel Bacon, Mr James Bray, & Mr Edward Bray “the whole of that estate . . . “. Other witnesses were Edward Frisell, Thomas Richards in 1674 in York County, Virginia. (see note 30). Movements to Maryland and Virginia: (Note: If this John Gowen is the parent of Esau Goeing and Thomas Gowing of Talbot County, Maryland and Westmoreland County, Virginia, then he may have moved back to Maryland to join his sons in 1679. Thomas Going had moved to Talbot County, Maryland in 1671, and Esau Goeing is noted as living in Talbot County, Maryland in 1672). John Gowen is noted as being in York County, Virginia in 1682, so he would not have stayed in Maryland long (if this is the same person). John Gowen (Gawen) is mentioned in York County, Virginia records from 1683 to 1698. Records include John Gowen working with several estates being an auditor in the case of Joseph Topping v. Thomas Mountfort (50), an auditor in the case of Daniel Parks and James Whaley (56), posting bond for the estate of Francis Hurd (60), appraising the estate of John Donnell and appraising John Donnell’s inventory and filing the return for the appraisal with the court (64, 66, 72), appraising the estate of Rowland Jones and filing a return for the appraisal (69 and 70), an order to appraise the estate of John Daniel and making a division of the estate of John Daniel (62 and 73). John Gowen (Gawen) is also involved in several lawsuits between 1683 t0 1690, including receiving an order against Capt. Mathew Trim (51), an order to pay Capt. Mathew Trim (52), an order against George Glascock for nonappearance (53), a judgment George Glascock (54 and 55), an order against Edward Malen for nonappearance (57), an attachment against the estate of Edward Maylen (58), a judgment against Edward Hayton (61), a judgment against Thomas Ballard Jr and john Weymon who are executors of Edward Jones (63), a nonsuite of John Farre’s lawsuit against him (71), a judgment against Richard Rogers (74), an order for the nonappearance of Richard Davis (75), an attachment against the estate of John Spillman (76), an order against Joseph Fryth for nonappearance and then a judgment against Joseph Fryth on March 24, 1690. (77 and 79). Miscellaneous records involving John Gowen include a record showing he had been an ordinary keeper in Middle Plantation (later renamed to Williamsburg) (44a, 59), receiving land bounding Reedy Swamp from Henry Thompson and Mary his wife (67), paying a debt in the inventory and estate of Robert Cobbs (42), mentioned as the master of servant John Marshall (45), swearing to the account of Mr. Andrew Cole (46), and as listed in the estate records of George Hubank (47). 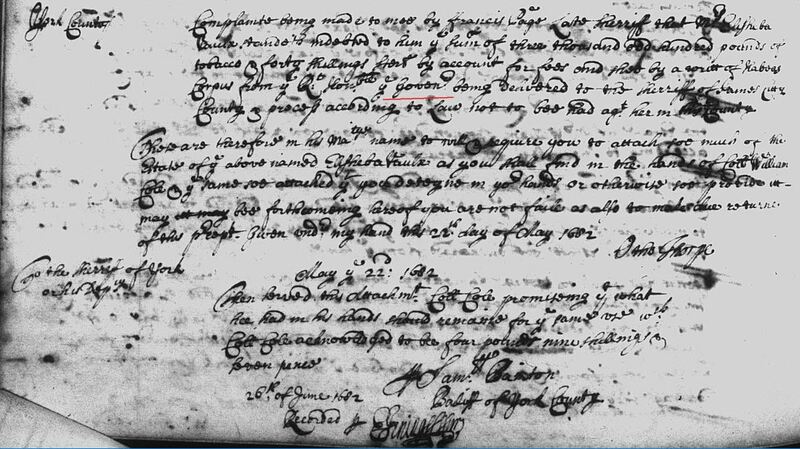 Possible death or movement: Last note of John Gowen being in York County, Virginia: On February 24, 1691, defendant John Gowen receives a continuance in a York County, Virginia case due to him being sick. The plaintiff in the case is Samuel Dean. In an Isle of Wight County, Virginia case, Samuel Dean, plaintiff, receives a judgment against John Gowen for his nonappearance in court on October 19, 1691. (79a and 80). None of these cases indicate that John Gowen is deceased . . . but they all appear to “suggest” he is no longer in York County, Virginia – as he is not personally involved in the cases in any way. The last case that confirms he is still in York County, Virginia is on March 24, 1690 where he receives a judgment against Joseph Fryth. (79). The continuance on February 24, 1691 (79a) suggests he may still be in York County, Virginia, but it also can suggest that he is out of the County and since he is sick and out of county, it would be too difficult to travel for the court case. 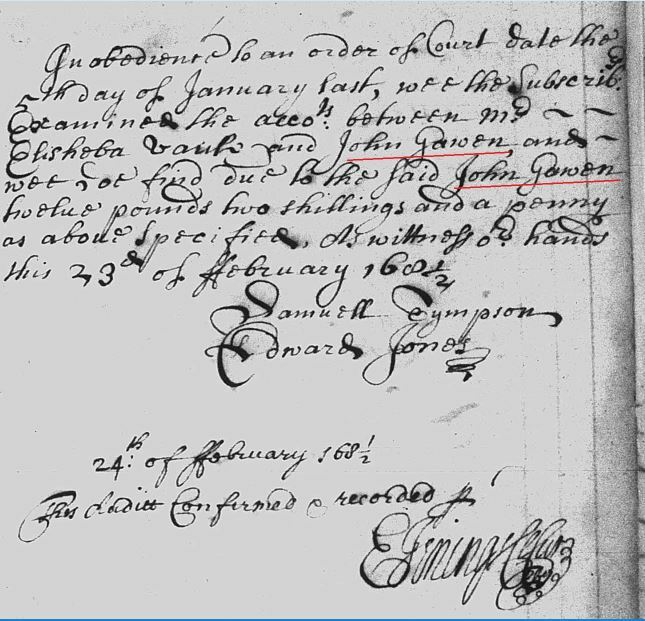 This February 24, 1691 entry is also the last entry that confirms John Gowen is still alive – but sick. He may have died shortly after this. The “assigned” cases from 1691 to 1695 do not confirm if he is alive or dead. 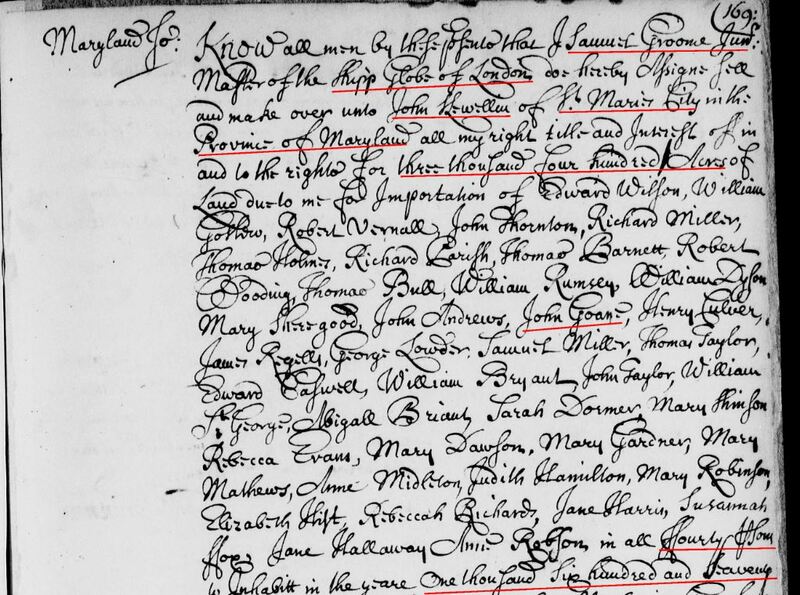 Appearance of Thomas Goen/Gowing and Esau Goeing in Westmoreland County, Virginia records: IF Thomas and Esau are children of John Gowen, then they probably had moved to New Kent County, Virginia, or Gloucester County, Virginia from around 1675/80 to about 1706. Both New Kent County, and Gloucester County had their court records, deeds, and wills destroyed by fires. But both counties show “Gowen” names receiving land patents in the 1600s in the state-wide databases for “grants”. Thomas Going and Esau Goeing both disappear from records from 1671/72 until 1693. It fits that their records would disappear if those records were located in New Kent or Gloucester Counties, Virginia. Possibly Thomas and Esau’s father had moved with them to one of those counties. 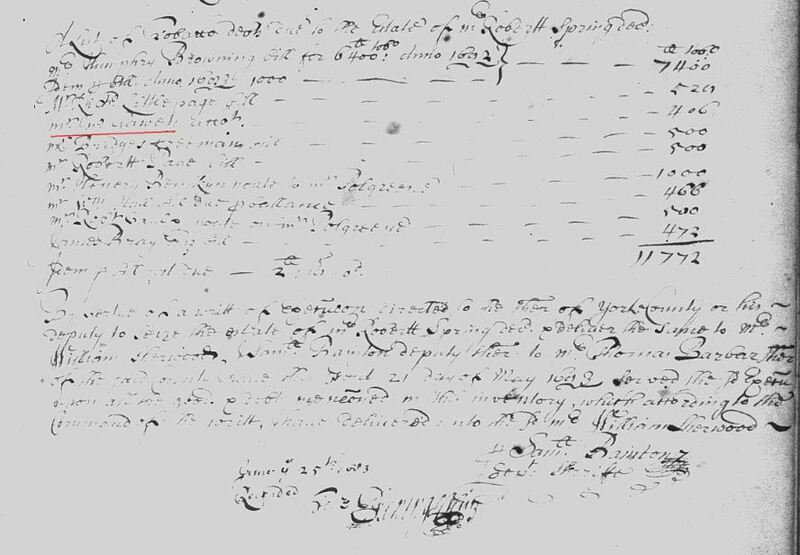 It may be that John Gowen was that father, and this is why the records in York County, Virginia from 1692-1698 do not refer to him as deceased . . . and why those records cease showing him present at any court cases after early 1691-1698, but still being mentioned in “assigned” cases. Thomas Going starts purchasing and receiving land in 1707 in Stafford County, Virginia. This may indicate the death date of John Gowen. He may have sold John Gowen’s land in New Kent or Gloucester and then used those proceeds to obtain land and move to Stafford County, Virginia. 9) 1650 Oct 18 – John Goane is transported to Virginia by Walter Broadhurst, Gent., who receives 500 acres, on S. side of Potomeck R., beg. at a point on the W. side of Poore Jack Cr., extending nigh the main river course NW to a point on the mouth of Conawoman Cr., which divides same from land of William Hardigg etc., to an Indian cleerfield, etc., 18 Oct 1650, p 249 Trans of 10 pers: William Hardigg, Robert Beard, William Enson, Ann Knowles, Richard Broadman, Hump. Farmar, John Goane, John Piper, Richard Sabrell, 2 Indians (see above). p. 199. 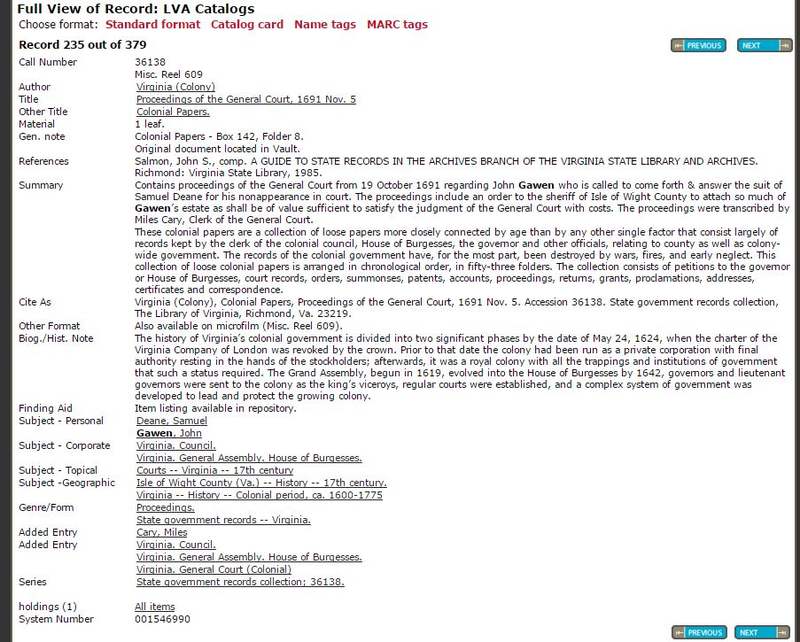 Va. Land Trans – Stafford Co., Va.
http://interactive.ancestry.com/48408/CavaliersPioneers-005066-577?backurl=http%3a%2f%2fsearch.ancestry.com%2fsearch%2fdb.aspx%3fdbid%3d48408%26path%3d&ssrc=&backlabel=ReturnBrowsing#?imageId=CavaliersPioneers-004685-199 Curioman Creek is same as Canawoman Creek: See: http://www.hookandbullet.com/fishing-currioman-creek-warsaw-va/ 1650 Oct 18 – John Goane transported S. side Potomeck R., at W. side of Poore Jack Cr., to mouth of Conawoman Cr. 12) 1653 Apr 14 – Wm. Gowin is transported to Virginia by Mr. William Hoccaday, who receives 1000 acres in York Co, near the head of Ware Creek, NW by N upon a former devdt and NW by N towards Warany Cr Trans of 20 pers: (Alexander Watson, Wm Mackgahye, Andrew Sharpe, Jane Johnson, Randall ____, Isabell Grace, Mary Reeise (? ), Tomason Madero (or Maders), Mary Graham, James _____, Edward Hodge, Richard Gillman, Willm. Moline, Fra. Peppett, Richard Jones, Michaell Barrow, Richard Moore, Joane Rivers, Ja. Nicholson, Wm. Gowin). Renewed 20 Nov. 1654. p. 257. 14 Apr 1653, p. 89. Va. Land Trans – York Co, Va.
18) 1661 Sept 25 an Arthur Severne is indentured to John Gowing, for 4 years in Virginia, according to the Bristol Parish Register, Charles City, Virginia. 30) 1674 July 24: p. 78 Whereas I gave the wife of me, Maj. Wyatt, in her widowhood with my consent, 100 pounds, as a jointure out of her estate, besides what what is given and enjoyed for her only child, Anne Jackson, which by two deeds under her hand dated 26 Feb. last; and whereas Mr. James Bray, one of the feoffees in behalf of my said wife and said Anne Jackson covenants, be it known that for fulfilling of said deeds made by my said wife Anne for herself and her daughter Anne Jackson, I Maj. William Wyatt assign to Hon. Nathaniel Bacon, Mr James Bray, & Mr Edward Bray the whole of that estate I had on hand in right of marriage to said wife, and give bond of 300 pounds. York County Virginia Records 1672-1676. Abstracted and Compiled by Benjamin B. Weisiger III. 37a) 1679 Jan 25: Whereas Edward Richardson was arrested to this Court at the suit of Mr. John Gowin for fourteen pounds tenne shillings and not appearing nor security returned, it is ordered that he should pay unto the said Gowin the said sum and of a(sp) has and have him to the next Court. 1677 to 1684 Deeds Wills and Orders York Co Va bk 6 p. 70. 37b) 1679 Jan 25: Whereas William Hughs was arrested to this Court at the suit of Mr. John Gowine (or Gwine) assignt Capt Otho Thorp for thirtie shillings – not appearing nor security returned it is ordered that the show pay the same and ope(sp) hee produce him to the next Court. 1677 to 1684 Deeds Wills and Orders York Co Va bk 6 p. 70. 39a) 1679 May 18: Estate of Nicholas Toop, decd. A list of debts belonging to the estate of Nicholas Toop, decd. In Money Debts . . . a large list of people includes Mr. John Gawen a note: 0-50. 1677 to 1684 Deeds Wills and Orders York Co Va bk 6 p. 106. 39b) 1679 Oct 23: Samuel Bainton I(sp?) pray do me the favour as to wave a reference for me until the next Court at the suit of John Goeing and John Cowen if there be a mosion for I am not well now in Condicon to goe to far; I pray faile not and you will much oblige ye (sp?). John Edmonson: October 23, 1679. 1677 to 1684 Deeds Wills and Orders York Co Va bk 6 p. 137. 39c) 1679 Oct 24: The difference between Mr. John Gowen plt and John Edmondson defendt is referred to next Court. 1677 to 1684 Deeds Wills and Orders York Co Va bk 6 p. 132. 41a) 1680 Jan 27: Record and Rel. Upon ye 27 day of Oct last past, Mr. Pope bought a horse of Mr Robert Spring, called by the name of Coby and did comitt to pay Mr. Robt Spring for the said horse the sume of sixteen pounds and his owne rideing horse which was then tye in Mr Springs yard, and the said Mr. Pope did exchange a shilling with Mr. Robert Spring upon the same and further I cannot declare. (signed): John Gawen. 1677 to 1684 Deeds Wills and Orders York Co Va bk 6 p. 187. 41b) 1680 March 22: I Edward Jones Attorney of Richard Booth Esq. and Compaine, have constituted and appointed my loving friend Mr. Martin Gardner my true and lawfull attorney to appeare for me in any action against Joseph Diserne in York Court as witness my hand this 22 Day of March 1679/80. (signed): Edw Jones. Wits: John Gawen, Humph Brownings. 1677 to 1684 Deeds Wills and Orders York Co Va bk 6 p. 214. 41c) 1680 Oct 26: Yorke County accounting record: By cost (Wise or West?) family and Mr. Gawen owed tithables when the list of tithables were taken at 100 tobo a pwk(sp?) – 00600. York County Court Orders 1677 to 1687. …By Coll West family and Mr Gawen on which tithables where the list of tithables were taken at 100 lb tobo at York …. – (either 60600 or 00600)… 1677 to 1684 Deeds Wills and Orders York Co Va bk 6 p. 258. 41d) 1681 Jan 24: These are to certifie that John Gawen of Bruton Parish intends this present shipping for England. Jan 24, 1680/81. Record and Rel 24 November 1680. 1677 to 1684 Deeds Wills and Orders York Co Va bk 6 p. 286. 41e) 1681 June 22: Robert Springs of Bruton in York County sends greeting, whereas William Sherwood of James Citty Gent at my request . . . stands bound with me in obligation to Major Otho. Thorpe of the penalty of 200 pounds sterl . . . (a loan agreement, agreeing to pay penalty amounts if not repaid in time) . . . In witness whereof I the said Robertt Spring and Ann my wife have hereto sett our hands and seales the two and twentyth day of June Anno Dom 1681. Signed: Robert Spring, Ann Spring. Witnesses: John Gawen, Fitz. Lawrence. 1677 to 1684 Deeds Wills and Orders York Co Va bk 6 p. 321. 41f) 1681 Dec 2: A Refference to the next Court between Mr. John Gawen and Mr. Elisha Vaulx. 1681 Dec 2: A Reffce between the said Gawen as Attorney of Capt. Thomas Gransham and the said Mr. Vaulx to the next Court. 1677 to 1684 Deeds Wills and Orders York Co Va bk 6 p. 361. 1681 Dec 12 (record date): 1678 Aprill 1 (agreemt date): Know all men by these presents that I Capt. Thomas Grantham Attorney of Mr. Samuell Hemings of London doe deputie impower, constitute and make John Gawen of Virginia my lawful attorney in my stead and place to sue for levye, require, recover and receive all such debts, summes of money and tobacco which is now due to the said Hemings or which hereafter shall or may bee due oweing or belonging to ye Estate of ye said Heming in Virginia and whatsoever my said Attorney shall act and lawfully doe for ye recovery of any such sum of money or tobacco I doe ratify and hold firme and stable as if my self were personally present. In witness whereof I have hereunto sett my hand and seal this first day of Aprill 1678. Signature: Tho Grantham. Witnesses: Martin Gardiner, Jno Carver. Recorded: Dec 12, 1681. 1677 to 1684 Deeds Wills and Orders York Co Va bk 6 p. 365.
returned to the next Court. 1682 Jan 5: Judgment is granted Mr. John Gawen Attorney of Capt Thomas Grantham Attorney of Mr. Samuell Hemings against Mr. Elisheba Vaulx for thirty nine pounds sterl which ye said Mr. Vaulx is ordered to pay with costs at execution. 1677 to 1684 Deeds Wills and Orders York Co Va bk 6 p. 367. 41i) 1682 Feb 23/24: In obedience to an order of Court date the 5th day of January last, wee the subscribed examined the accounts between Mr. Elisheba Vaulx and John Gawenand wee doe find due to the said John Gawen twelve pounds two shillings and a penny as above specified, as witness our hands this 23d of February 1681/2. Samuel Tympson, Edward Jones. 24 of February 1681/2 This Auditt Confirmed and Recorded. (Copy of Audit also transcribed on page). York County Court Orders 1677 to 1684. bk 6, p. 385. 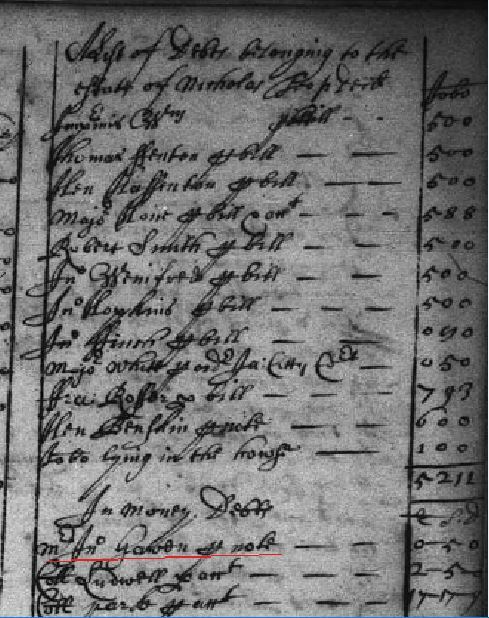 41j) 1682 Feb 24: The auditt of accounts between Mr. John Gawen and Mr. Elisheba Vaulx was this day presented in Court and Confirmed and judgmt is granted to ye said Gawen agt ye said Vaulx for twelve pounds, two shillings and one penny sterl being due to ye said Gawen on ballance of ye said accounts which ye said Mr. Vaulx is ordered to pay with costs of suite at execution. 1677 to 1684 Deeds Wills and Orders York Co Va bk 6 p. 374. 41k) 1682 June 22: Complainte being made to mee by Francis Page late Sheriff that Mr. Elisheba Vaulx standeth indebted to him ye sum of three thousand odd hundred pounds of tobacco and forty shillings sterl by account for fees and thee by a writt of habeas corpus from ye Rt Honble ye Gowen being delivered to the Sherriff of James Citty County and process according to Law not to bee had agt her in this County. 1682 May 22: These are therefore in his Majesties name to wit and require you to attach soe much of the estate of ye above named Elisheba Vaulx as you shall find in the hands of Coll William Cole and ye same soe attached if you detayne in your hands or otherwise soe provide in may bee forthcomeing hereof you are not faile as also to make due returne of this perept. given under my hand this 22 day of May 1682. Otho Thorpe. 1682 May 22: Then levied this attachmt Mr. Coll Cole promiseing ye what he had in his hands should remaine for ye same use Coll Cole acknowledged to be four pounds nine shillings seven pence. Signed: Samll Paxton, bailiff of York County. Recorded June 26, 1682. York County Court Orders 1677 to 1684. bk 6, p. 413. 41l) 1682 Aug 22: Samuel Weldon and Sarah Weldon of James Citty County Virginia, convey 50 acres of land in Middle Plantation to Mr. Edward Malin of ye said County Bricclayer. Part of 100 acres given to Capt Robert Higgison and his heirs in 1646, being part of 850 acres of land purchased by John Clark decd of Leiut Richard Popeley out of a patent of 1250 acres granted to said Popely June 10, 1630 and sold to Mr. Peter Eford and his heirs by Coll George Read by sale recorded in York Court said 50 acres of land bounded . . . Signed: Samll Weldon, Sarah Weldon. Witnesses: John Gawen, Tho Bromer, Pe: Weldon. Recorded Aug 24, 1682. York County Court Orders 1677 to 1684. bk 6, p. 422 (2nd page numbered 422). 41m) 1683 Jan 24: A reference between Mr. Robert Spring and John Gawen to the next Court. York County Court Orders 1677 to 1684. bk 6, p. 445. 41n) 1683 Jan 24: It is ordered and desired that Mr. Saml Tympson and Mr. John Gawen auditt and settle and see delivered up the estate of John Batten to Mr. Thomas Barber his guardian, and make report thereof to the next Court. York County Court Orders 1677 to 1684. bk 6, p. 446. 43a) 1683 March 22: An Inventory of the Estate of Robertt Cobbs decd taken and appraised by servce of an order of Yorke Courtt this 22nd day of March 1683. Mr. Thoams Paylor, Capt Crystopher Peirson, and Mr. James Wilkins – appraisers. Mr. John Gawen listed under Cash Accounts. York County Court Orders 1677 to 1684 bk 6, p. 487. 43b) 1683 Aprill 24: It is ordered that some tyme between this and next Courtt Mr. John Gawen and Robert Crawley doe meete appraise the estate of William Dickinson orphan and what doth belong to him, to be delivered to Rickd. Peirce his guardian. York County Court Orders 1677 to 1684 bk 6, p. 492. 43c) 1683 Aprill 24: Know all men by these psents that I Edward Hilliard Planter in Mulberry Island, out of the love and affection I bare to my kinsman Robert Haley hand given and granted and doe for me my heires and assignes, frely give unto him the said Robert Hayley, one black cow aged abt 6 yeares slitt and cropp on the right eare and hoe overkeeles on both eares wth all here encrease(sp?) to him the said Robert Hayley and his heires for ever; the said Cow and her encrease, to be in the custodie of Robertt Weekes, till the said Robertt Hayley comes of age, desireing and requesting that this may be recorded in Yorke Courtt, as wittness my hand this 10th day of Aprill 1683. Signed: Edward Hylliard. Witnesses: Martin Gardner, John Gawen. Recorded April 24th 1683. York County Court Orders 1677 to 1684 bk 6, p. 495. 43d) 1683 June 25: A list of Tobacco debts due to the Estate of Mr. Robertt Spring, decd. Recorded June 25, 1683. York County Court Orders 1677 to 1684 bk 6, p. 504. 43e) 1684 March 24: A Refference to the next Court betweene Thomas Graves and Phillip Gawin. York County Court Orders 1677 to 1684 bk 6, p. 566. 43f) 1684 May 26: Mary Grey imported in the Judeth Capt Mathew Trim commander servt to Mr. John Gawin is adjudged seaventeen yeares of age and ordered to serve according to Act. York County Court Orders 1677 to 1684 bk 6, p. 579. 43g) 1684 May 26: Judgement is granted Thomas Graves against Phillip Gawin for the payment of one hundred nynety pounds of tobacco and casks with costs of suite at execuson. York County Court Orders 1677 to 1684 bk 6, p. 580. 1685 Jan 5: This John Daniel was buried 14 October 1688 (Brewster Parish Register), York, VA.
Other Notes: The last will and testament of John Daniel who married Mary Williams is dated 5 Jan. 1685. The probate of the foregoing will was granted to Barrentine Howle (Howles) who between the death of the testator and the time the will was presented for probate had married Mary Daniel, the executrix and widow. It is likely the will had been withheld from probate about two years and that John Daniel had died shortly after the will was written, about 1686/7. In the name of God, Amen, the last will and testiment of Mr. John Dannell I doe first bequeath my soule to God Almighty and my body to the Earth from which it came. I do first give to my eldest son, John Dannell, all my lands, houses, orchard and plantation unto him and his heires forever, and if my aforesaid son dyes without heires, then to return to my son William Dannell, and heires forever, and hee dyes without heirs then to return to my eldest daughter and her heires forever, and if shee dyes without heirs then to return to my youngest daughter and her heires for ever, and for my psnell estate,. It is my will that itt should bee equally devided amonge my wife and children, and that my wife should have her lifetime in the plantacon and Land and my wife doe marry then in en dayes the estate to bee equally divided and appraised and to my younges daughter Mary I give two silver spoons above her parte and it is my will that my children shall one more colt apeice of the two mares that I now have , them and their encrease to the children and heires forever, and my to wholy executrix, and to my Godson George Bates, I give one cow calfe being a red calfe with some white in her face, her and encrease to him and his heires forever, and if my wife dyes, thns I leave my loving friends, Mr. Benjamin Buck and Mr. Edmond Bruer to looke after my children & there estates, while they come att age. Proved then Open Court by the Oathes of the witnesses and probatt is granted to Barontine Howler (Howles) an intermarry with the deceased (cannot read word but is wife, she being executrix in herein mentioned as is recorded). John Daniel of York, made his will 5 Jan 1685/6, proved 24 May 1689; to son John all lands, houses, etc. ; If John die without issue, to son William; if he die without issue, to eldest daughter (not named); if she die without issue, to younger daughter Mary. To daughter Mary two silver spoons; to godson George Bates a cow and calf. Wife Executrix. If wife dies, loving frineds Mr. Benjamin Bujck and Mr. Edward Bruce to look after my children. Witnesses: Mary Bruce and William Pinkethman. Probate granted to Barontine Howler (Howles) who had married executrix. Source: Genealogies of Virginia Families, Vol. 1, Public Library, New Bern, NC, R929.2G. General Notes: John’s will was made 5 January 1685-86 and proved 24 May 1889, Book No. 8 (1687-1691) in York County, VA. On 24 May 1689, from the York County,Virginia court records on page 260 is the will of John Daniell. (Will Book 8 (1687-1691). Virginia Wills 1632 – 1800. 1686 Feb 24 – John Wright aged about 23 years sworn sayeth … that at the house of Mr John Gawin, Joseph Bascome and John Marshall, Mr Gawins servt, that was and now is was at a game at cards called Putt and that the sd Balcome did pass his bill for five pounds ster to the sd Marshall at that present but do here declare as a slander by that it was not fairly won. Feb 24, 1685/86. Signed: John Wright. Sworn to in York Court and is recorded. 1686 – John Gawin‘s former servant – John Marshall: In 1686 we find John Marshall, a former servant of Mr. John Gawin, of York county, engaged in a game with Joseph Bascom, in which the latter lost a wager of five pounds sterling, a sum equal in purchasing power to one hundred and twenty-five dollars in American currency, a proof of how far the gambling went even among persons of very moderate means. 1 ^, In the course of the same year a game took place between Captain Soane and Richard Dearlove, of Henrico county, in which ten puts were played for a stake of fifteen hundred pounds of tobacco. Soane was successful, but as Dearlove refused to pay when called upon, a suit was entered against him in court. 18 In 1690 Allanson Clerk, of the same county, who had won four pounds sterling of Peter Rowlett in a game of put, was thrown out of court because, when the game was played, no sum was placed in the hands of a stakeholder, or regular contract to pay such a sum was drawn up, as required by law to give the betting a legal footing. 19 . . . 16 York County Records, Vol. 1675-84, orig., p. 328. “York County Records, Vol. 1684-7, p. 144, Va. St. Libr. 18 Henrico County Records, Vol. 1677-92, orig., p. 300. “Henrico County Minute Book, 1682-1701, p. 279, Va’. St. Libr. 45a) 1686 May 6: p. 164. Order against the Sher. is granted John Gauin for the nonappeareance of Christopher Hurt. 1684 to 1687 bk 7, York Co, Va. p 164. Signed: Jer Ham. Wit: Rowland Jones, James Arthur. Memorandum in Court on May 25, 1686 … Signed: Rowland Jones, James Arthur, John Goine (or Gwine), Samuel Bainton. dues. 1684 to 1687 bk 7, York Co, Va. p 204. 45b) 1686 June 24: p. 190. Judgement is confirmed Mr. John Gawin against Capt. James Arther Sheriffe for the payment of two pounds ster for his nonappearance of Xopher Hurt which he is ordered to pay with costs at execution. An Attachment is granted the Sherriffe against the estate of Xopher Hurt for the securytie of two pounds ster for his nonappearance at the suite of Mr. John Gawin, with costs returnable to the next Court according to Law for judgement. 1684 to 1687 bk 7, York Co, Va. p 190. (reverse: “Mr. Jno Gawen account Judmt … upon this acct). Newport News Museaum and Archives at Virginia War Museaum. (NN92.7.4AR). Isaak Godding. 1684 to 1687 bk 7, York Co, Va. p 255. 47a) 1687 May 24: p. 317. An order against the Sherr is granted Mr. John Gowen for the nonappearance of Thomas Jacobs, returnable to the next Court according to Law for judgment. 1684 to 1687 bk 7, York Co, Va. p 317. 47b) 1687 June 24: p. 349. Judgment is granted Mr. John Gawen against Henry Binford for the payment of two pounds twelve shillings ster due by bill being proved in open Court by the oath of Alexander Berryman which said Binford is ordered to pay with costs at exc. 1687 June 24: p. 349. Itt is ordered that Mr. John Gowen pay to Alex Berryman for one days attend according to Act, being sumd as an Evydence against Hen Binford with costs. 1684 to 1687 bk 7, York Co, Va. p 349. 1688 Feb 24 John Gowen appointed as auditor of case between Joseph Topping and Thomas Mountfort in York Co Va p. 86 – Whereas the last court the difference depending between Mr Joseph Topping plt and Mr Thomas Mountfort Deft was referred to an auditt, and to make report thereof to the court the land, and by the consent of both the plt and the defnt the said order is continued, and Mr John Gowen is ordered and appointed to bee one of the auditors, and it is further ordered that . . . (Note: this entry is at the bottom of page 86, page 87 is missing, so the end of this order is missing). York County Court Records, 1687 to 1688. pg. 86. Contains p. 1-149 of court record book no. 8, Aug. 1687-Sept. 1688. 1688 Feb 24 John Gowen recs an order agt Capt Mathew Trim in York Co Va.
An order against the Sherr is granted John Gowen for the nonappearance of Capt Mathew Trim. Returnable to the next court according to law for judgment. York County Court Records, 1687 to 1688. pg. 88. Contains p. 1-149 of court record book no. 8, p. 88. Aug. 1687-Sept. 1688. 1688 May 24 An order agt the Sherr is granted John Gowen for the nonappearance of George Glascock. York County Court Records, 1687 to 1688. pg. 120. Contains p. 1-149 of court record book no. 8, p. 120. Aug. 1687-Sept. 1688. Judgment is this day granted Mr John Gowen against George Glascock for the paymt of seaven pounds eighteene shillings Ster. being due by presented bills of exchange which hee the said Glascock is ordered to pay with costs of suite. Execution being Staved of till ye next court and then the said Glascock to bringe the conditions made betweene them if in case the said bills of exch did come in (ptested?) then the said Glascock to pay the same in tobacco at 10.8 (per?) hundred. York County Court Records, 1687 to 1688. pg. 138. Contains p. 1-149 of court record book no. 8, p. 138. Aug. 1687-Sept. 1688. 1688 Dec 13 will recorded, 1687 Aug 15 will written, – Rowland Jones last will in York Co, Va. Bk 8, pgs. 186-188. 1689 Jan 22 – A refference by consent between Robert Bradley plant and John Gowen Defendant. bk 8, p. 195, York Co, Va.
1689 April 6 – bk 8, p. 277 (p. 280-297 missing in bk 8), York Co, Va.
… may of any time or times hereafter arrise or occur relating and concerning the estate of Frances Hurd, Orpht and pay the same as it shall become and accrew due to the said Orpht according to Law. That then this obligation to be voyd – olea be remaine in full force and voched. Signed sealed and delivered: Henry Thompson, Robert Bee, John Gowen. In the precence of Samuel Bainton. An Account of the goods abroad and remaining in the house of Edward Jones, decd, this 6th of April, 1689. 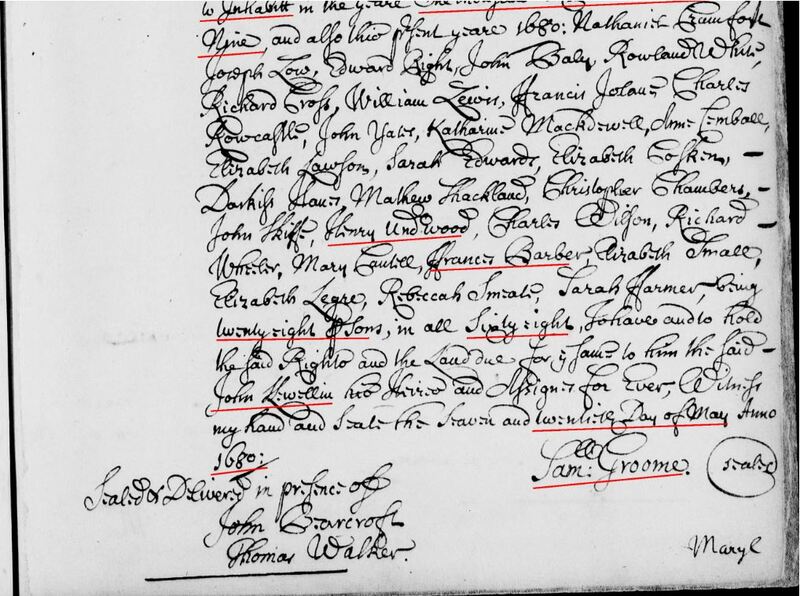 1689 May 24: Bond of Henry Thomspson, Robert Bee and John Gowen. For £100 sterling. To keep the Court harmless from any damages that may at any time arise concerning the estate of Francis Hurd, orphant, and pay the same to the orphan. 1689 July 24 – Gowen v. Malen judgmt bk 8, p. 279. York Co, Va.
1689 Aug 17: 17 Aug. 1689. Henry Thompson of James City County, planter, and Mary his wife, one of the daughters of Morris Hurd, to John Gowin of York County, For £10 sterling. Land bounding on the Reedy Swamp which was sett apart for Mary’s share of the land given to her sister Ann. From: York County, Virginia Deeds, Orders, Wills, Etc., No. 8, p. 320-321. Part One 1687-1691 – Abstracted and Compiled by John Frederick Dorman 1689 Aug 17 – Thompson and wife to Gawin bk. 8, p 320-321. York Co, Va.
(Note: The following entries give a little more information on the location of the land involved in the transaction above). York County Virginia, records 1665-1672 bk 4, p. 50. York County Virginia, records 1665-1672 bk 4, p. 54. 1668 Oct 26 – p. 385. Morris Heard with consent of wife Anne, living in Middletown Parish, York Co., sells to Nicholas Lewis of Hampton Parish, York Co., 50 acres land, part of a dividem I bought of William Gantlett, from Skimino Creek a mile or thereabout, next to John Smith, Thomas Pinkethman and Nicholas Lewis, upon west side of my dwelling house. York County Virginia, records 1665-1672 bk 4, p. 385 (285). 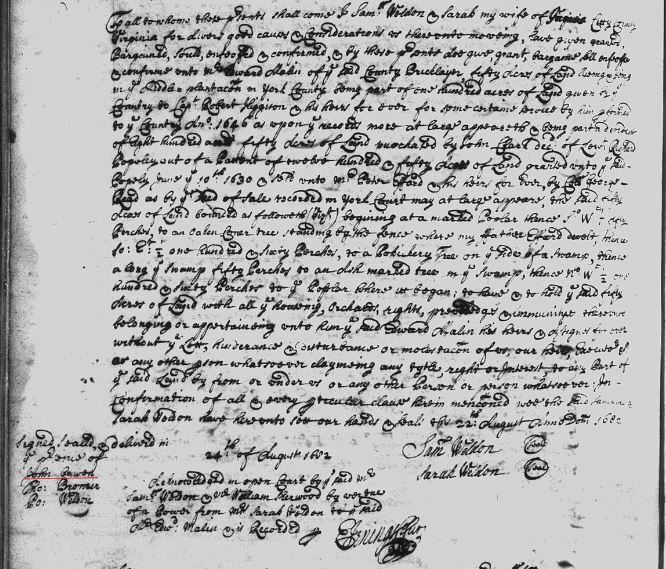 1684 Jan 29 – p. 553-554 – Last Will and Testament of Morris Hurd – written on July 15, 1680, probated Jan 29, 1684. … I give … to my loveing wife Ann Hurd the plantation where I now dwell with … land runneth by John Smiths line to a chestnutt stump at the head of the Reedy Swamp known to the said Smith Thorne(sp?) eastward to the line betwixt James Cooper and I am to keep the lyne southward to the Swamp dureing life and then to my eldest daughter Elizabeth Feere and her heirs if she should have any properly borne of her owne body that shall …. to inherit, if not then to be divided between my other 3 daughters to them and their heirs forever. … I give unto my second daughter Mary Hurd so much land as … from the aforesaid bounds by John Daniel’s line unto the lyne of trees… made to William Gybson by that lyne westward to James Coopers lyne so southward to the aforesaid bounds to her and her heirs if she should have any borne of her owne body if not then to be devyded beween my other children to them and their heirs forever. … I give to my third daughter Ann Hurd all the remaine of my land toward the Creek to her and her heirs borne of her owne body if not then to be divyded between my other children to them and their heires forever. … I will that no tymber be given or sold of the sayd land. … I will that no part or parcell of the aforesaid land be leased or mortgaged for any tearme of years. … I give and beqeuath to my youngest daughter Frances Hurd three and twenty pounds ster money to be paid at the day of her marriage. … I will that 3 and 20 head of cattle be equally divided between my loving wife and my 3 youngest daughters, and the division to be made within a month after me decease so everyones part with the increase to run for them and their heirs the four steers leave for the good of the house. … I give to my daughter Elizabeth Feer one old bay mare to her son one mare fole. … my pewter to be equally divided between my wife and my 3 youngest daughters. … if all my daughters should die without heirs then my land shall fall to Henry Tyler to him and his heirs forever. All the rest and residue of my personal estate goods and chattels I give to my loveing wife whome I do make my sole executrix of this my last will and testament. Henry Tomson Sr and Richard Page I do appoint overssers of this my last will and testament ….. Signed: Morris Hurd. Wit: James Cooper, Nicholas Luis, John Smith. York County Court Orders 1677 to 1684 bk 6, p. 553. 1684 Feb 25 – The order of Court for the appraisement of Morris Hurd estate … ordered that William Pinkethman be in the room of Edwd Brewer and that the appraisement on Monday next do meet at the said Decds house and apprasie the said estate …. York County Court Orders 1677 to 1684 bk 6, p. 561. 1684 March 24 p. 565 – Morris Hurd decd – order for division of estate. York County Court Orders 1677 to 1684 bk 6, p. 565. York County Court Orders 1677 to 1684 bk 6, p. p. 568. 1684 March 24 – p. 568-569 – Morris Hurd decd, appraisement .. Whereas Morris Hurd by his last Will and Testament in anno 1680 did give his land (according to the bounds therein mentioned) between 3 daughter and if any of them dyed without issue then the part of her so dying to descend to and be divided between his other surviving daughters and their heirs, and whereas Ann Hurd, one of the daughters, is since dead, it is the oppinion of this court that that part of the said land to her given doth descend and ought to be divided among the surviving daughters as parcent and coheirs to their sd father. It is therefore ordered that the land given by will be according to the bounds therein expressly laid out and then that part given to the sd Ann Hurd be equally divided between Thomas Feere as marrying Elizabeth Hurd, Henry Thompson marrying Mary Hurd, and Francis Hurd being the surviving daughter and that a writt partition facienda issue forth accordingly and ordered the survivors of the County be present to acct therein. Court adjourned to the 24th day of May next …. An appraisement of the Estate of Morris Hurd late of Bruton Parrish in the County of York decd made in obedience to an order of Yorke County Court bearing date at York ye 24 of Jan 1683/84 by … Thomas Taylor, Robert Perryman, and Wm Pinckethman being first sworne before Capt James Archer one of his majesties justices of the peace for York County. (Itemization of goods listed on p. 569). 1689 Sept 24 – A refference to the next Court to between Mr John Toton plt and Barentine Howles as marrying the execturix of John Dannel, decd. bk 8, p. 310. York Co, Va.
From YORK COUNTY COURT RECORDS, Deeds, Orders, Wills, Vol. VIII (1687-1691) pages 309, 313, 349, 362-363. Mrs Ann Jones was by vertue of an Ordr of York Court sworne to this Inventory & appraisemt by Mr Robert Booth one of their Matyes Justices for this County & recorded P[er] E Jenings C. Cur. 1689 Nov 7 – Gowen v Rogers bk 8, p. 325, York Co, Va.
A refrl to the next Court by consent between John Gawin plt and Richard Rogers deft. 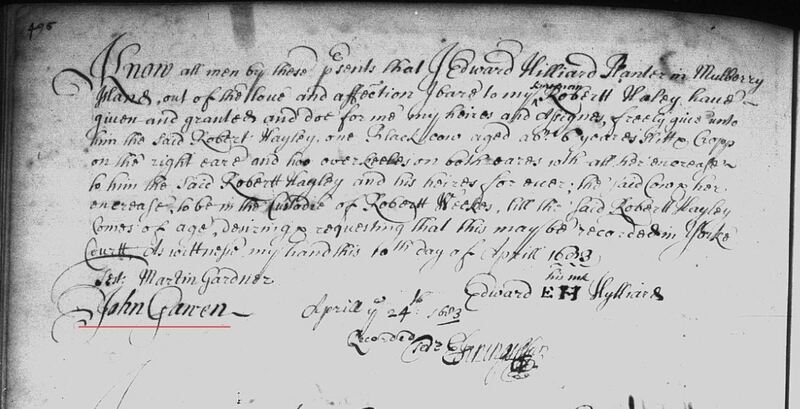 1690 Feb 24 – 3) An order against the Sherr is greanted John Gawen for the nonappearance of Joseph Fryth. bk 8, p. 389. York Co, Va.
(Note: the 3 entries above are all listed back to back on same page). 1691 Jan 26 – A refference to the next Court between Mr Samuel Deane assign John Gawen plt and Thomas Yates, Deft. Bk 8, p. 528. York Co, Va.
1691 March 24 – Mr Samuell Dean assignee of John Gawen haveing brought this action against Yates who is security for Henry Shittle and bill for the payment of 600 pounds of Tobacco and cask convenent in York County, and the sd Yates producing in Court a bill of the said Gawens in discount for 344 pounds of tobacco and cask payable to Mr Daniell Parke which Mr Paynes Weldon attorney of said Parke was assigned and the said judgment is granted the said Samuell Dean against the said Yates for present paymentof the balance being 256 pounds of tobacco and cask with costs of suite at exe. York Co, Va. Bk 9, p. 9. 1691 Oct 19 – General Court from 19 October 1691 regarding John Gawen suit by Samuel Deane, who is called to come forth & answer the suit of Samuel Deane for his nonappearance in court. The proceedings include an order to the sheriff of Isle of Wight County to attach so much of Gawen’s estate as shall be of value sufficient to satisfy the judgment of the General Court with costs. The proceedings were transcribed by Miles Cary, Clerk of the General Court. 1693 Sept 25: Mr Hugh Owen as assignee of Mr Martin Gardner sd assignee of John Gawing arresting John Spelman to this Court in an action of debt for sd summe of four hundred twenty three pounds of tobacco and caske and bill sd account and hee not appearing order it granted against Capt Thomas Ballard High Sherr at his security at ye next Court to be confirmed if he causeth not ye said Spilman then personally to appear and answer sd same. — 1687 to 1697 Deeds Orders Wills of York County, Virginia. pg 256. 1693 Sept 25: Capt. Thomas Ballard High Sherr hath ordered granted him for an attachment against ye estate of John Spelman for four hundred twenty three pounds of tobacco @ casks return in lbs to ye next court: Hee ye said Spelman now failing to appear at the court to answer sd suite of Mr Hugh Owen as assignee of Mr Martin Gardner assignee of John Gawen in an assignment of debt for said tobo sum with costs. — 1687 to 1697 Deeds Orders Wills of York County, Virginia. pg 256.
p. 114 – 1695 Feb 25 Mrs. Sarah Smyth administratrix of Mr. Willm. Smyth assignee Jon: Gawin, hath order for an attachment against the estate of Capt. Roger Jones for 362 pounds of tobacco per bill, Jones being returned non est inventus to this Court. 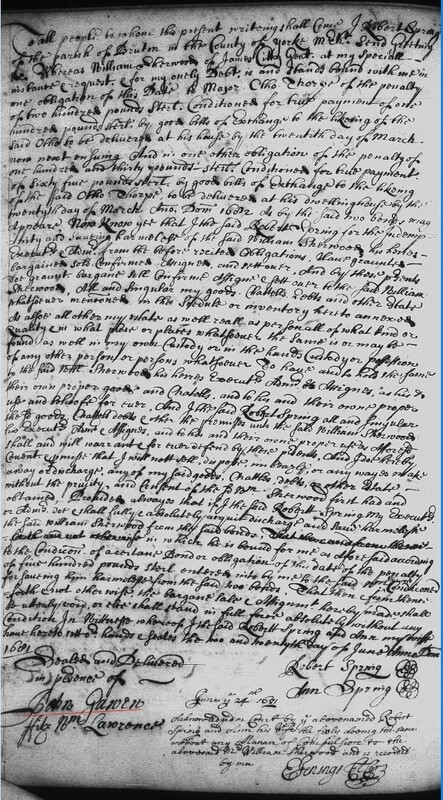 p. 152 – 1695 April 13 The attachment obtained by Mrs. Sarah Smyth, administratrix of Mr. Willm. Smyth assignee of John Gowing, against Capt. Roger Jones for 362 pounds of tobacco per bill is att the request of Mr. Hugh Owen her attorney againe continued. 1698 April 26 – 30 acres in possession of John Gawin is found to be escheat and is granted to Daniel Park in York County, Virginia.